Representatives from the Arkansas Army National Guard presented the flags at the 2013 Military Appreciation Day pre-game festivities. The Southern Arkansas University baseball team will be paying tribute to the armed forces at their third-annual Military Appreciation Day set for Saturday, April 12, 2014. Veterans and military service members will enjoy free admission with a military I.D. to watch the SAU Muleriders take on Delta State University at 3 p.m. and 6 p.m. at the Walker Stadium and Goodheart Field. Prior to the first pitch, a reception will be held from 1-2:30 p.m. at the Mulerider Activities Center, located adjacent to the baseball stadium. A light lunch will be served at the reception, including wraps, chips, drinks and dessert. 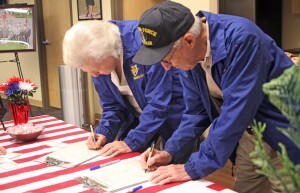 Martha and Louis Blanchard sign in at the 2013 Military Appreciation Day Reception at the SAU Mulerider Activities Center. The public is invited to come fill the stadium, which will be adorned with American flags, cheer on the nationally-ranked Muleriders, and pay tribute to those who have or are currently serving to protect our country’s freedoms. Chandler Walley will sing the “National Anthem” when the players hit the field at the beginning of the first game and “God Bless America” during the seventh-inning stretch. Military Appreciation Day is a coordinated effort with SAU Athletics and the SAU Veterans Resource Center. SAU has earned recognition for three straight years as a Military Friendly School, ranking SAU among the top 20% of schools nationwide that deliver the best experience for military students. To find out more about Military Appreciation Day, contact the SAU Veterans Resource Center at 870-235-4026.